WINSDAY: Peppermint and Tangerine… Yum! 1. My oil business is booming right now, and as a result my blog has kind of taken a back seat. Sorry guys, I’ll try to post at least once a week, but I can’t make any promises at this point. Because of the craziness that’s going on right now, I’m going to start making my WINSDAY and Friday Fun Facts biweekly (unless I’m feeling adventurous! LoL). 3. WINSDAY GIVEAWAY! I’ll be making a roller bottle of Peppermint and Tangerine and will give it to one lucky winner. This is a killer combo and works wonders at increasing focus and alertness. I also like to use this in the morning to give me that mood boost that citrus oils are so famous for. Many people and “oily” friends I know use Wild Orange and Peppermint, but I’m a Tangerine girl. It feels a little more exotic and has a bit of a crisper scent to me. (Don’t get me wrong, I like Wild Orange, but I like Tangerine more!). Peppermint is also known for its ability to help support a healthy respiratory and digestive system, so by all means, don’t just use this blend for focus! In fact, I’ve used this blend when I needed a little extra support for my digestive system, and loved it. You know I only recommend one brand of essential oils, so if you’d like more info on that please email me at info@amandagerber.com and I’ll answer any questions you have for me. Have an amazing and productive day! Comment below for an entry in the giveaway! You have until Tuesday September 22, 2015 to enter. These are just a few reasons you will fall in love with fennel, but one reason I love this oil is because when combined with a Mother’s Milk/Increased Lactation tea, fennel can help assist in increasing a mother’s milk supply. This giveaway seemed appropriate since August is National Breastfeeding Awareness month. I have personally nursed (and I am currently still nursing my youngest) 3 beautiful boys. Happy breastfeeding, y’all! To all you moms out there currently struggling with nursing: keep at it! Yes, there are times it hurts. Yes, there are times at 3AM when having someone else feed the baby sounds like a dream. BUT, there are those sweet moments when the world is quiet and it’s just you and your baby with oxytocin flowing and it’s worth every minute of the struggle. You can do it! So, would you like to give Fennel essential oil a try? Comment below and tell me why you’d like to give this a go, and you’ll be entered to win a bottle of this oil. For an additional entry, follow me on Facebook (link on the sidebar). This giveaway will be going on until midnight Tuesday, August 18, 2015. Have an amazing day! Congrats to our winner, Sarah! This giveaway is now closed. Oh, happy day! Guess what day it is? WINSday! Today I have a 5 mL bottle of Lemon essential oil up for grabs. This oil is truly amazing. I use it daily in my house, for so many reasons. 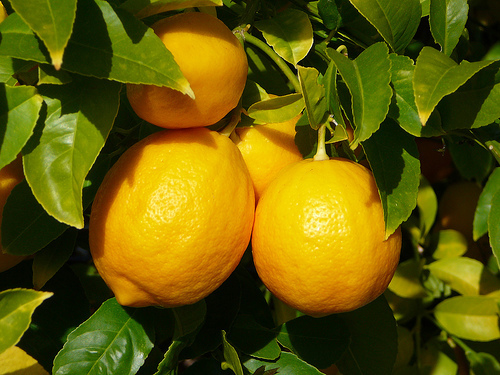 This lemon essential oil is sourced from Sicily and is cold pressed from the rinds of the lemons. This oil can be used aromatically, topically, and internally. Of course, as always, I only recommend my particular brand of oils, because I trust the quality of the oil. For more information on the brand I use and how to get these awesome oils in your home, please email info@amandagerber.com. I drink this oil in my water almost daily. I like to alternate between lemon and grapefruit oil. It acts as a natural detox for your body, helping it to cleanse naturally. I also love to diffuse lemon to freshen the air in my home and elevate the mood. Another way I use lemon essential oil is in my all purpose cleaner. I have a glass spray bottle that I fill with water, mix with citrus oils, and spray away all the germs on my countertops, sinks, bathtubs, and toilets. Lemon essential oil is also great to use in your laundry routine. I am VERY forgetful these days and sometimes a load of towels gets left in the washing machine overnight. You know that funky smell that wet clothes can get when they sit too long? Simple solution: Go ahead and put in your detergent to run the washing machine again, but add 10 drops of lemon essential oil to the party and your load will smell very fresh and clean when it’s done washing. Lemon can also be great to use in a classroom (take note for next school year, teachers!). I have had great success removing stubborn stains from whiteboards by simply putting a few drops of lemon oil on the whiteboard and scrubbing away with a towel. Again, it’s great at killing germs that kids like to spread around. You can also use it to remove “sticky” messes: gum on a rug, crayon drawings on the floor, ect. So, how can you get this amazing oil in your home? Simply comment below about something lemon oil related: a success story you have, something you learned, or ask a question. You have one week from today to comment, and if you don’t end up being the lucky winner you can always email me at info@amandagerber.com. Have a wonderful day! These statements have not been evaluated by the FDA. Products and methods recommended are not intended to diagnose, treat, cure or prevent any disease. The information provided here is in no way intended to replace proper medical help. These are simply things that have worked for me personally, and my family and friends. Congrats to our winner Hannah Harper! This giveaway is now closed. Let’s be honest. The more structure in my life, the better. I need structure in my life, and I thrive off of structure. So, one of my sisters gave me the idea of having the weekly giveaway on the same day every week and then giving my readers a week to participate. I thought it sounded good, and it had structure, yay! I know, I’m a bit nerdy, but how do you think I got through grad school with two toddlers and one more baby on the way? Structure, people… and schedules… and Jesus. A whole lot of Jesus. So, today I am going to give away a roller blend that I make and use on my family when those Texas sized seasonal threats begin. It’s also great to have on hand to help soothe skin irritation (like mosquito bites. Can I get an “amen!” from my fellow Texans?!?). This roller bottle is a blend of lemon, lavender, and peppermint. Lemon essential oil helps support a healthy respiratory system and helps to open the airways as well as acts as a natural detox for your body. Lavender essential oil is a natural soothing oil and helps soothes skin irritations. Peppermint supports healthy respiratory system and promotes clear breathing. This blend has helped my family tremendously. A couple of years ago before I started using the oils, I had taken Noah and Timmy to the doctor for what I thought was a terrible cold. Turns out it they were just having a flare up to seasonal threats around them. This is a reoccuring theme for them: weather change? Flare up. Spring time blossoms? Flare up. Tons of rain? Flare up. We had mixed luck with other methods to try and find relief . So, I went out and bought some roller bottles and mixed up equal parts of lavender, lemon, and peppermint oil and then diluted it with coconut oil so I could even use it on my baby. I like to roll it on the bottom of their feet and the back of their neck. It provided so much relief, and as long as I am consistent with putting the oils on them (sometimes I forget!) it helps so much at supporting their bodies when those seasonal threats are in the air. So, how can you get your hands on this blend? Leave a comment below and let me hear why you want to give this a try or let me know about something you learned on this post. For an additional entry in the drawing, follow me on Facebook (there’s a link on the sidebar). You have until Tuesday, June 23, 2015. The winner will be announced next Wednesday. Have a lovely day! This giveaway is now CLOSED. Congratulations to our winner Amanda! Today I am going to introduce to you my favorite essential oil blend from my trusted company: Grounding blend. Just thinking about it makes me relax in my chair. The Grounding Blend is a blend of spruce needle/leaf, ho wood, frankincense, blue tansy flower, and blue chamomile flower essential oils in a base of coconut oil. It’s got the nice woodsy, sweet smell to it that makes you want to breathe it in for days. I use this oil every single day. I put it in my diffuser (along with a citrus oil) and it has helped my mid-afternoon grumpiness craziness I am prone to. Also, it’s already diluted with coconut oil so if one of my kidos is having a meltdown I can pour a drop in my hand and rub it right on their feet or chest. So between myself and my boys (remember 4 years old and under here) we go through about a bottle a minute! Just kidding… but you get the point; it’s that amazing! From my own personal experience I can honestly say this has helped me recover after the birth of my children as well as keep my anxious feelings at bay. I can start to feel when I’m getting stressed, and mentally as well as physically I start to get tense; so I’ll grab my bottle and put some of the Grounding Blend on my feet, or even just smell the bottle and it calms me down. This oil, in my opinion, is a must have for every mom. Remember, you can email me at info@amandagerber.com to get the oils in your home, but what I’m doing today is a Mother’s Day Giveaway. I want to give away a bottle of this amazing blend to a deserving mom. So, what do I need from you? Leave a comment below of a mom you would like to nominate to win this bottle and why they should win (go ahead and brag on them! Let them know they are loved!). This will be open today through Friday (May 8, 2015) ending at 11:59PM. I will announce the winner on Saturday. Share below and she could be the lucky winner! DISCLAIMER: This information is not regulated by the FDA and is not intended to cure or treat disease. It is for informational purposes only. I am just a mom, not a doctor, sharing my experience with essential oils and how they’ve helped my family.